The 2019 Harley-Davidson Sport Glide is a Softail that is designed for performance without sacrificing the brand’s iconic style. The Sport Glide, also known as the Softail model FLSB uniquely combines graceful sophistication with a raw, aggressive style to create a one-of-a-kind look at the road. When you contact Harley-Davidson of Baltimore soon to get more information about the Sport Glide for 2019, you can also set up an appointment to test drive it and to experience its impressive capabilities on the road. Each Harley-Davidson on the road today has a unique look with individualized design elements, and you may discover that the 2019 Harley-Davidson Sport Glide near Columbia has the head-turning style that you are looking for in your new bike. It features a low-riding seat atop a lightweight Softail frame. The Sport Glide has an elongated stance on the road as well as an aerodynamic mini-fairing that adds a modern touch to the front end. The fairing promotes the rider’s comfort, and it notably can be removed for those times when you want to enjoy the wind whipping around you in a cruiser-like fashion. The cast aluminum engine elements feature a blacked-out look that is paired with the perfect combination of chrome accent pieces for definition. This two-tone look extends to the elongated dual mufflers placed on both sides of the rear wheel. Enclosed cargo packs are located on both sides of the rear wheel as well, and they feature a Harley-Davidson logo that lacks lettering for a modern touch. The machine-finish wheels give the bike an aggressive look, and the angled spokes on the front wheel are in direct contrast to the angled fork that slants in the opposite direction. Color options include twisted cherry, vivid black, midnight blue, barracuda silver and several other stunning hues. Our sales associates serving Columbia Westminster Bel Air Maryland are thrilled to show you the Softail model FLSB in person when you stop by soon for a test drive appointment. 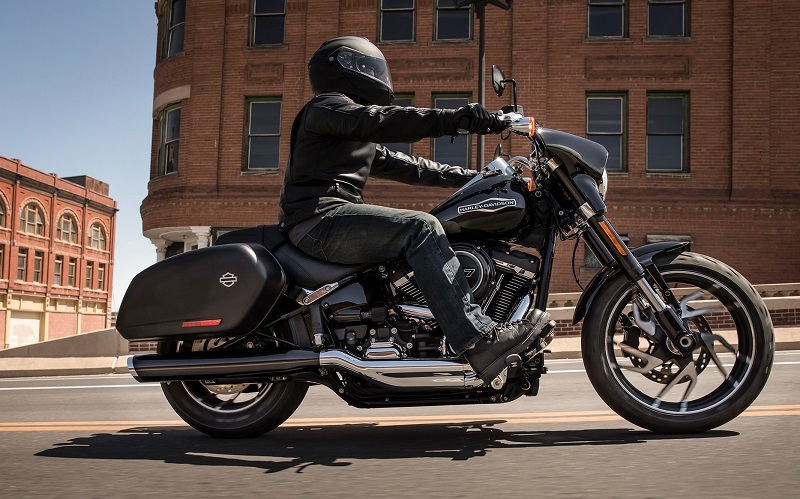 The 2019 Harley-Davidson Sport Glide is a mid-range Softail model that has the perfect mix of modern features to ensure your comfort and convenience on the road. Its standard features include an LED forward lighting system, a keyless ignition and a USB port. A 5-inch analog gauge features the speedometer while retaining a classic look. A digital readout adds a modern touch and gives you information about the bike’s mileage, fuel level, trip distance and more. Other standard features include engine diagnostics, cruise control, a low oil pressure light, a low battery voltage reading, anti-lock brakes, a security system and more. 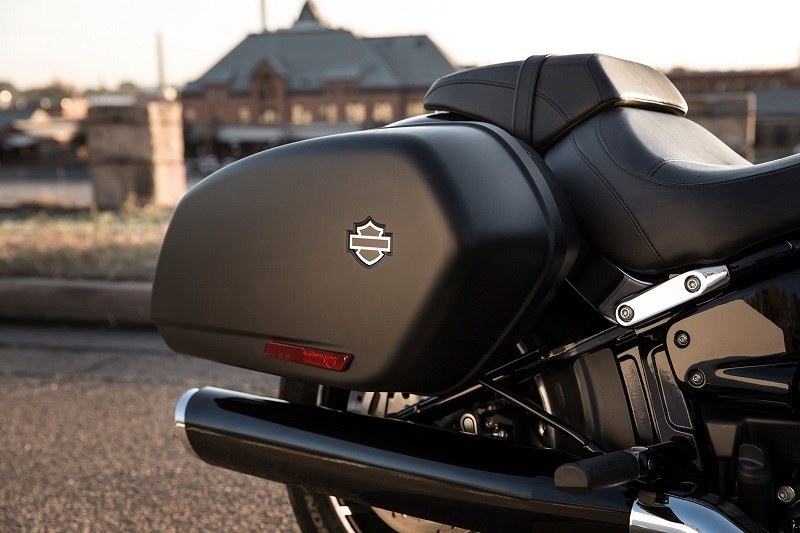 The rear saddlebags have a firm cover and a locking feature to protect your cargo on the road. You can see that the Softail model FLSB has everything that you are looking for in a bike. By contacting our sales associates serving Columbia Westminster Bel Air Maryland soon, you can get more information about these features and learn about add-ons available for customization. 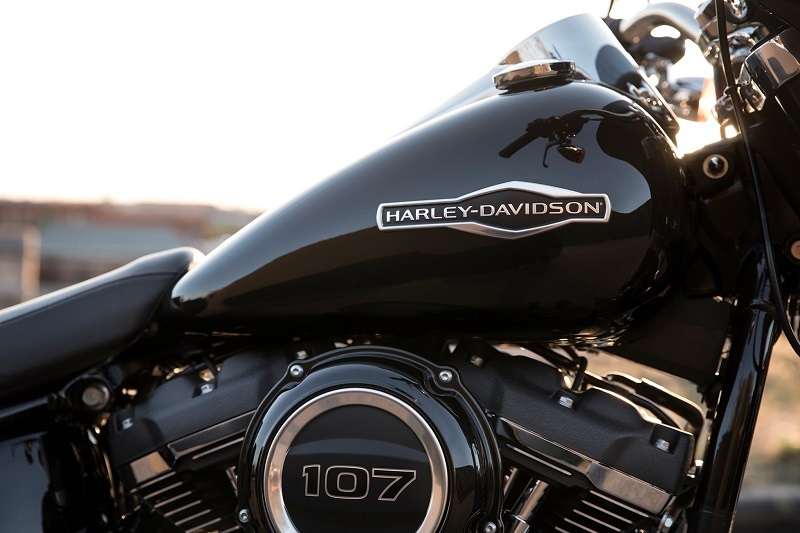 When you take home a bike like the 2019 Harley-Davidson Sport Glide, you understandably expect it to generate aggressive power while being responsive and easy to control. The new Sport Glide has been designed to give you this riding experience, and it is powered by a Milwaukee-Eight 107 engine. With the power of this engine paired with a lightweight body style, you can expect to enjoy rapid acceleration and humming power on the road. The powertrain features a 2-into-1 muffler with an embedded catalyst, and it also comes with electronic sequential port fuel injection. The high-performance suspension is paired with a rear mono-shock and an inverted fork to ensure a smooth, responsive ride. 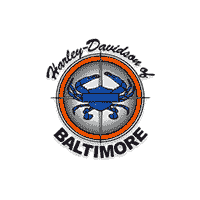 If you contact Harley-Davidson of Baltimore today to get more information about the Sport Glide’s capabilities and features, you can make plans to take it out for a test ride soon. The 2019 Harley-Davidson Sport Glide near Columbia has the impressive style, modern features and overall superior performance capabilities in its standard equipment that you may have been searching for. However, you do not have to stop there. Our helpful sales team serving Columbia Westminster Bel Air Maryland is thrilled to help you explore the many customization options available for your new Sport Glide. Some of the many options include saddlebag Travel-Paks with grips, bullet turn signals, a street cannon muffler in a variety of finishes, a modified windshield, a sundowner seat, a tallboy seat, a sissy bar, a brake pedal trim piece in a range of finishes, a luggage rack, a brake lever kit, several headlamp trim options, a handle mount for a SiriusXM satellite radio device a water-resistant phone carrier mount, a navigation system mount and much more. You can see that these and other accessories can be added to the 2019 Harley-Davidson Sport Glide near Columbia to give you the ideal riding experience. 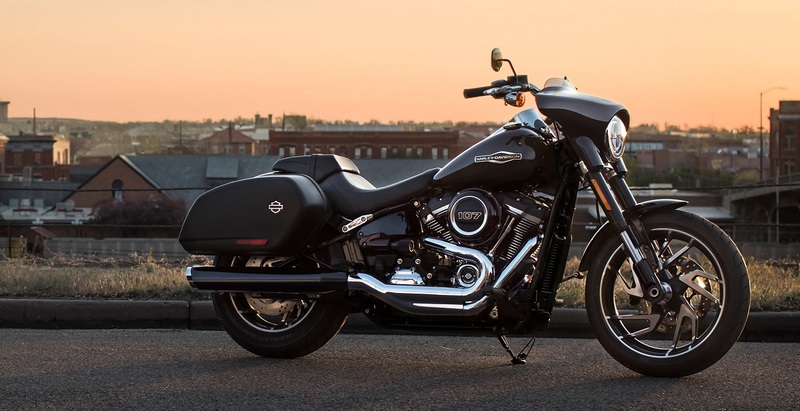 The Sport Glide for 2019 is one of several Softail models that you can check out when you stop by our local Harley-Davidson dealership. Our sales reps can help you to learn more about the features and performance capabilities for the Sport Glide and to assist in your comparison and selection. 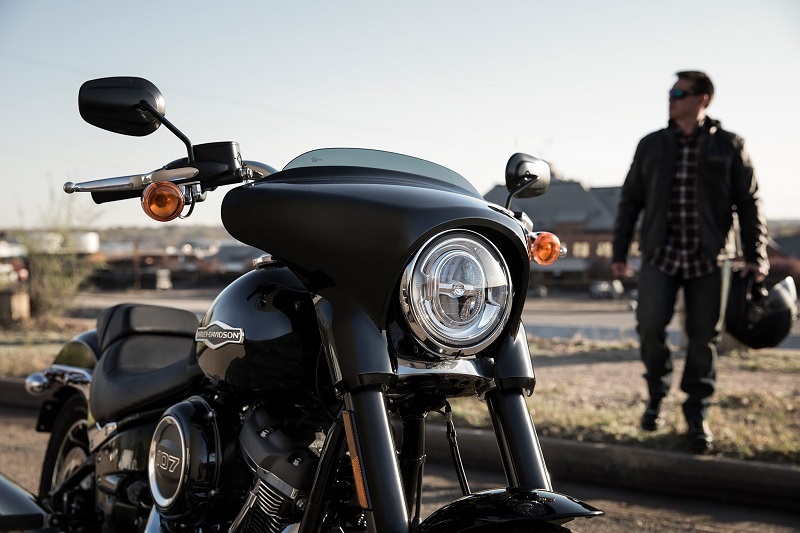 When you contact Harley-Davidson of Baltimore today, you can get all of your questions answered about the new Sport Glide, and you can schedule an appointment to meet with us for a test ride. You may also drop by the dealership during business hours at your leisure.